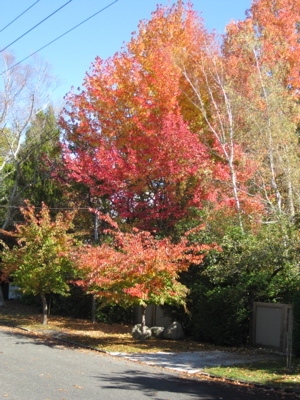 We met under the glowing autumn oak – my friend from Wellington and me from Cambridge. The oak tree was in Turangi, beside Lake Taupo, halfway between us, and what great place to spend a night and a day. a fishing retreat of unexpected charm. The cottage was warm, spacious, nicely furnished right down to a coffee plunger and plenty of wine glasses. We drank a Hawkes Bay Syrah as we talked past midnight. A tui sang a little too early in the morning for us, from the mixture of native and introduced trees. Creel Lodge has a secret path to the river bank, so we wandered along catching glimpses of anglers, thigh deep in the Tongariro River, their trout flies flashing and enticing. Pathways lead past pools, and over bridges, alongside luxury lodges and simple family holiday houses. 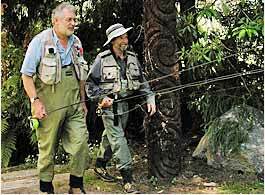 I would love to return and hire a guide, like one of these men, who would kindly coach me into the apparently serene mysteries of trout fishing. I would actually be content to simply stand in that placid water for hours on end- but learning to tie those pretty earring-like flies would be fun. Catching a fish would be a dubious bonus. The Turangi info centre assure me they can arrange it all. 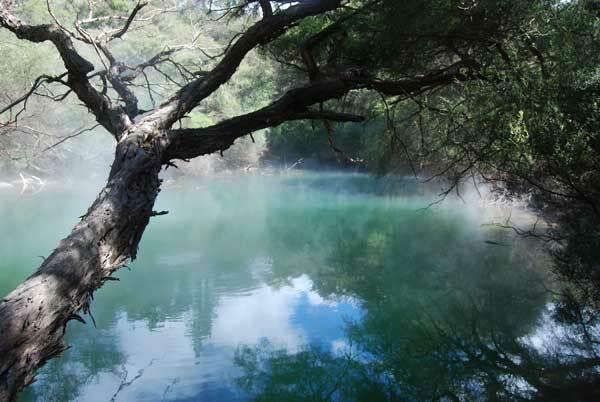 As well as three volcanoes nearby, and the famous Tongariro Crossing, there are the charming Tokaanu mineral pools, 6km away. Jenny and I enjoyed 20 minutes soaking in an oblong shaped private pool under a blue sky, then finished off with a few lengths in the outdoor pool, with native bush, birds, and only one other person to be seen. In less than 24 hours, we refreshed our long friendship, had some great autumn exercise and best of all discovered an intriguing part of New Zealand that I have always just driven through. Before the snow lands on those mountains, I must return.